I've already blogged about my buffalo wing escapades at Wingman, Buffalo Wild Wings, Buffalo's Wings N' Things, and BC Burgers and Chix, so it's no secret that I love buffalo wings. Who doesn't, anyway? 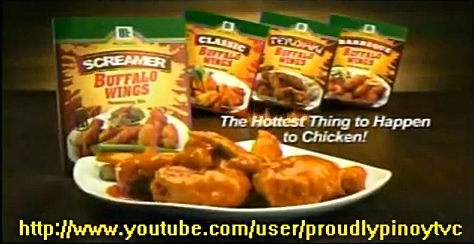 I recently tried McCormick's Buffalo Wings Seasoning Mix for some chicken lovin' at home. There are four mix flavors - Classic, Barbecue, Teriyaki, and the hot one McCormick dubbed as Screamer. Among the four, the Screamer appealed to me the most so that was what I bought. Place the wings in a plastic bowl (or Ziploc bag). Seal the bowl then shake until the wings are evenly covered with sauce. This McCormick seasoning mix is okay. The wings are not as awesome as buffalo wings done from scratch, but they are good enough, especially considering the short preparation and cooking time. According to the package, with this seasoning mix, you'll be able to enjoy New York-style buffalo wings that are extremely hot. You know how your body reacts when you're eating hot and spicy food -- you begin to sweat, get teary eyed, and start to sniff? Yeah there's a bit of those but to describe the wings as extremely hot is a bit of an exaggeration. Sure, the buffalo wings are hot, but they are not extremely hot. Medium hot, more like it. For health-conscious consumers, the ingredients and nutritional information are listed below.